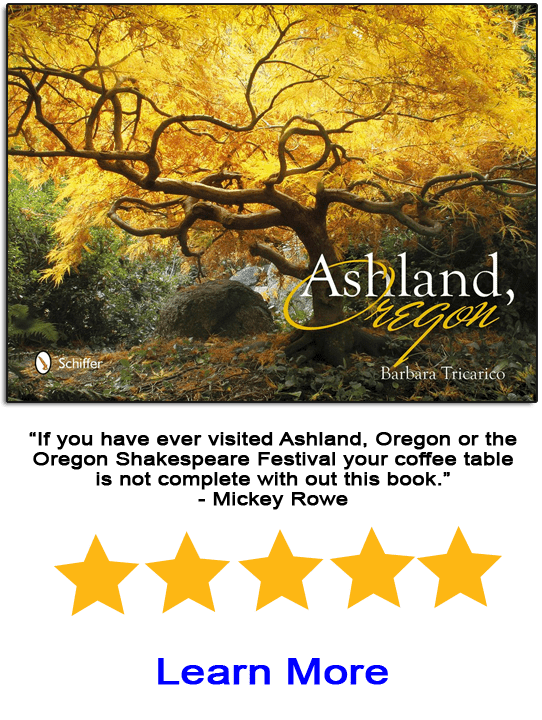 There are countless spots in Southern Oregon, the Rogue Valley and in and around Ashland to hike and soak in the pristine beauty of the area. 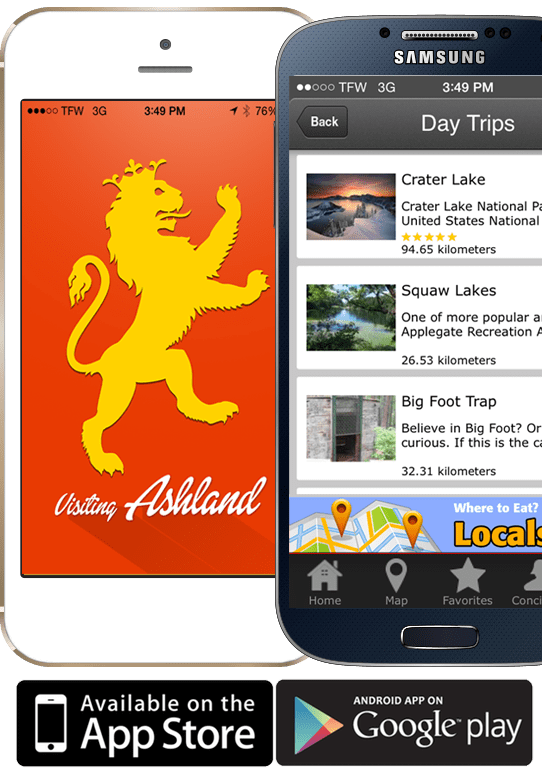 One of the special aspects of Ashland is our ability to hit the trails right from the center of town! So whether you prefer to take advantage of the ease and convenience of trails out your front door, or want to head to more remote locations, below you’ll find a list of options to satisfy. One important item to note, when hiking in the area, be sure to stay on the trails to avoid contact with poison oak. Centrally located next to Ashland’s main plaza, Lithia Park offers a wide range of walking and hiking trails to explore. As you enter the park from the plaza, the sidewalks will pass by some open lawn space, a duck pond, a playground, bathrooms and along Ashland Creek. Eventually the sidewalk will turn into a trail and it will offer occasional options to turn left and uphill to a series of trails. Follow these trails south along the direction of the flowing creek to end at the reservoir, perhaps for a cooling summer swim. If your adventure takes you uphill, the trails will lead to you to the roads above Lithia Park. If you veer left once you reach the top, the roads will lead you back to town or to tranquil neighborhoods with great views of the Cascades. If you choose to turn right on the road, you can continue south to the reservoir – or you could head uphill on Ashland Loop Rd. to the Alice in Wonderland trailhead (see below) if you desire a longer hike. Click here for a detailed map of the park and its features and trails. Directions: At Ashland’s main plaza, walk to the south side of the plaza where you will encounter the entrance to Lithia Park. This trail is part of the Ashland Watershed Trail system and is an wonderful option for those looking for a hike right from town. It also leads to the White Rabbit Trail (see below) for those looking to extend their hike. If you are heading from town, you can expect to spend the “to” portion of the hike heading uphill, while the “fro” portion will, of course, head downhill. Directions: From the downtown plaza, head southeast down Main St. to Pioneer St. Take a right and head up just past the Oregon Shakespeare Festival and at the fork, follow the center road, the appropriately-named Fork St. Continue along Fork St. above Lithia Park, where it will turn into Glenview Dr. Before Lithia Park ends, take a left and head uphill on Ashland Loop Rd. When you see Ashland Loop Rd. intersect with Morton St. continue up Ashland Loop Rd a few hundred feet where you’ll see the Alice in Wonderland trailhead on the right. If you miss the trailhead, you can continue up Ashland Loop Rd. to the top of the White Rabbit and Alice in Wonderland trails. The White Rabbit Trail is a wonderful and popular Ashland hike due to its gorgeous vistas of the valley and close proximity to town. This is also one of the Ashland Watershed Trails. Another great aspect of the White Rabbit is it is easily combined with other trails (Alice in Wonderland, Oredson-Todd, Caterpillar, and/or Toothpick) to add to one’s hike. The trail itself consists of a steady climb to the top of the trail if you are starting by Park St., or downhill decent if you start from Alice in Wonderland or the parking lot off of Ashland Loop Rd. Directions: Like many of the trails in the Ashland trail system, there are a number of ways to get to the White Rabbit trail. The first option is to head straight out of town on foot and heading up the Alice in Wonderland trail, which ends at the top of the White Rabbit trail. A second option is to drive or walk up Ashland Loop Rd. to a parking lot that is located at the top of trail. A third option, which is particularly great for those staying on the South end of town, is to go to the Siskiyou Blvd. and Park St. intersection and head uphill on Park St. Park at the top of the hill on one of the side streets. Walk up to the end of Park St and follow the path along the base of the mountain which will lead you a map of the area and the White Rabbit trailhead. Toothpick Trail, the third and last trail discussed here that is part of the Ashland Watershed Trail system, is a well-known spot just a short drive from town that is quite popular with hikers, mountain bikers and dog owners. The trail starts off with some incline, but then flattens out for a large portion of the trail. About half way along the trail there is a bench and an opening in the forest for a beautiful view of Mt. McLoughlin. There is a trail map at the top in the event you’d like to continue your hike along either Lamb Mine (recommended for beautiful views) or Caterpillar Trail that could lead you all the way back into town and/or to the top of the White Rabbit and Alice in Wonderland trails. This hike is a brilliant experience for hikers as it offers views of Mt. Shasta, Mt. McLoughlin, part of the Rogue Valley and Ashland. After an uphill climb for the first part of the trail, the trail flattens considerably for the rest of the gorgeous loop out and back. Directions: Head out of town from the center of Ashland down Siskiyou Blvd to Ashland St, where you will take a left. Follow Ashland St. over I-5, and just after half a mile take a left on Dead Indian Memorial Highway, which you will follow for 6.6 miles. You will turn left on Shale City Road at this point and continue for 2.9 miles. Turn left on BLM Road 38-2E-9.2 and go for three quarters of a mile to a fork in the road, and continue straight uphill for .9 miles to the parking lot. Lower Table Rock is a volcanic plateau that is situated just north of Medford and the Rogue River and offers a well groomed and pleasant spot for a hike. After spending much of the hike heading uphill, you will reach the top of the plateau where you’ll have the opportunity to see for miles in nearly every direction. Great views of Mt. 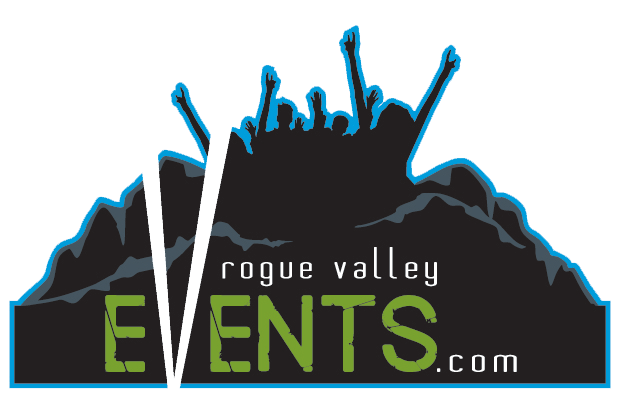 McLoughlin, the Rogue River, Medford and the Siskiyous are highlights. Directions: From Ashland, head to I-5 where you will head North toward Medford. Take exit 33 toward Central Point. Follow Pine St., then take a left onto Hamrick Rd. Hamrick will curve to the right and turn into Vilas Rd. Shortly thereafter you’ll arrive at Table Rock Rd. where you’ll take a left. Follow Table Rock Rd. for 7 miles, and take a left onto Wheeler Rd. to the parking lot. Upper Table Rock is quite similar to the Lower Table Rock hike, though a better option for those looking for a slightly shorter and/or a slightly less challenging hike. The views are similar yet the plateau is smaller at Upper Table Rock. Directions: Follow the directions above for Lower Table Rock. Once you take a left onto Table Rock Rd., you’ll continue for roughly 4.4 miles and then take a right onto Modoc Rd. Continue on Modoc Rd. for 1.5 miles to the parking lot on your lefthand side. If you have a clear day and the time and means to drive up the winding mountain road approximately 35-40 minutes up to the base of Mt. Ashland’s ski resort, this hike will reward you for your efforts. Once at the ski resort, continue to the parking lot toward the backside of the mountain where you can leave your car and meander to some incredible views of the Siskiyous, Mt. Shasta and Pilot Rock. The trail is wide and continues uphill to the summit. Views on the North side of Mt. Ashland include Mt. McLoughlin, Grizzly Peak, Mt. Thielsen and the Three Sisters. Directions: From Ashland downtown, drive southeast through town on Siskiyou Blvd until it merges onto the I-5 on-ramp. After 6 miles, take Exit 6 to Mt. Ashland. In .7 miles, turn right onto Mt. Ashland Ski Road. This winds uphill for 8.9 miles. Drive straight through the main parking lot to the back lot. The trailhead begins at the far end. This hike is the longest and most challenging option presented here at Insight to Ashland. It offers stunning views of the Siskiyous and is a less traversed trail as compared to the others mentioned above. At the top you will encounter views of Ashland, Medford, Grizzly Peak, and Mt. Ashland, among other treats. Directions: From downtown Ashland, head northwest on Lithia Way. Just out of downtown, Lithia Way turns into OR-99/N Main St. Follow OR-99 for about 4.5 miles where you’ll turn left onto Rapp Rd. Rapp Rd. follow a couple of sharp curves where it then becomes Wagner Creek Rd. Travel south on Wagner Creek Rd., and veer left at a junction after milepost 7. Continue for 2 miles to a fork and stay left. Continue another 2 miles, at which point you’ll see a parking lot on the right side of the road. The trail is on the other side of the road. Outdoor Recreation Safety Note: Please be sure to read our safety note on our Outdoor Recreation home page. Have a comment or question? We would love to hear from you! Please visit our Contact Page. and let us know. Keep up with our latest tweets on Twitter, and connect with us on Facebook. To learn about advertising options, packages and pricing, visit our Advertising Page. We also provide information on Reasons to Advertise with Us. 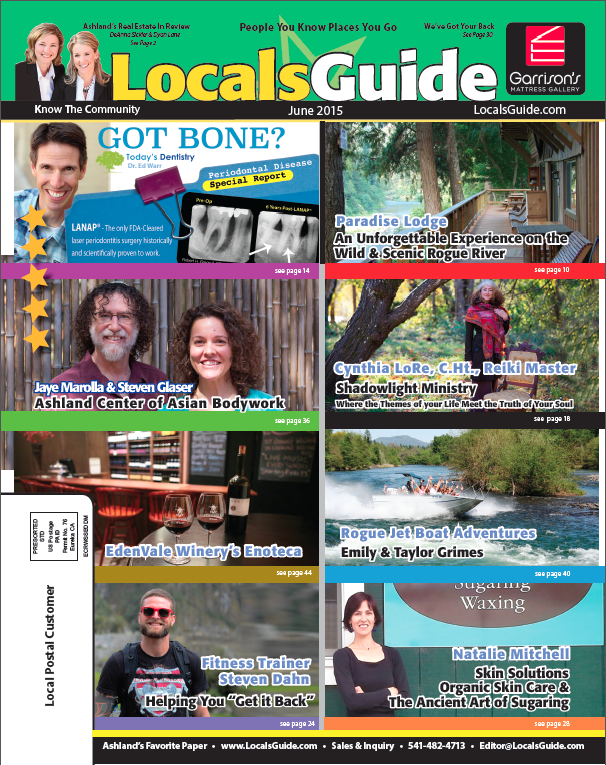 2015 © LocalsGuide LLC. All rights reserved.